Coldest Day on Record–Not So. Maybe. Go Figure. This morning I heard a TV weatherman say this is the coldest day (-16) on record in Chicago. Of course, I had to Google that assertion, especially because I wondered if, in my lifetime, I had now lived through the hottest and the coldest days on record in Chicago. Not surprisingly, I found out that the Cable TV was mistaken (large gasp!) or at least, misleading. Turns out, the coldest recorded temperature day in Chicago occurred on January 20, 1985 when it was -27 with a -60 wind chill. In the city (note: CITY) of Chicago. And, of course, the coldest day (-36) in Illinois (note: STATE of Illinois not CITY of Chicago or Chicago AREA) occurred in 1954, but that was in Congerville, Illinois, which may have disappeared into vapor that day because no one has ever heard of it since. And for those gardeners who miss summer, the hottest summer was in 2012, when we had four days over 100 degrees, but the hottest day ever was on July 24, 1934, when it reached a truly sweltering 105 in Chicago (but in 1954 East St. Louis climbed to 117!). Our Jacksonville grandfather was smart to have been in the ie business in those days. Congerville is likely some neighborhood within a town or city.. now. My current neighborhood was once part of a village unto itself within Glastonbury. Have a toasty day near your source of heat. 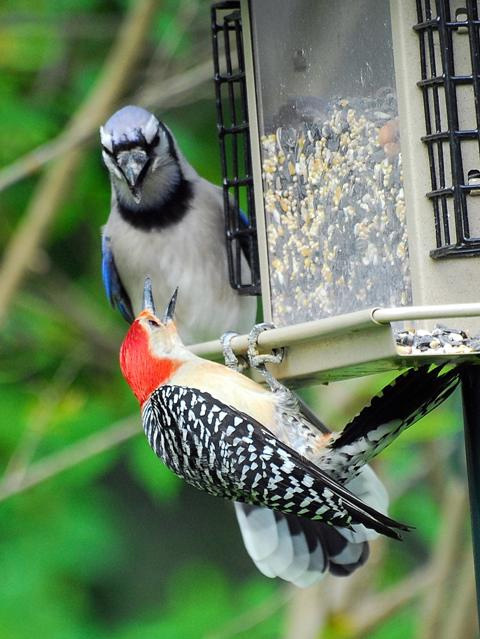 Love your photo of the woodpeckers. Thanks. Congerville is a village in Woodford County Illinois and according to maps lays between Morton and Bloomington-likely linked to the Conger family known for its large number of Politicians. Town is less than 2 miles square and population under 500. Thanks for the clarification. The news keeps saying’ coldest temps in 20 years’ but I truly remember the Jan. 1985 days of -27 in Chicago. I had a 6 month old Dalmation puppy and all we could do in our drafty Cleveland / Fullerton Apt. was climb into bed and stay warm! It will be interesting to see how the flora & fauna show this spring 2014. Yesterday I’ve found #2 dead Blue Jays in my garage. Unfortunately I stopped feeding the deer and birds last year because it brings Coyotes and I can’t risk them prowling regularly w/ a small dog in the family now! I’m thinking they meant the coldest day for THAT DAY (January 6 or 7)- not forever in the city proper. You are right though they could have been more clear. I guess the cold froze a few brain cells.